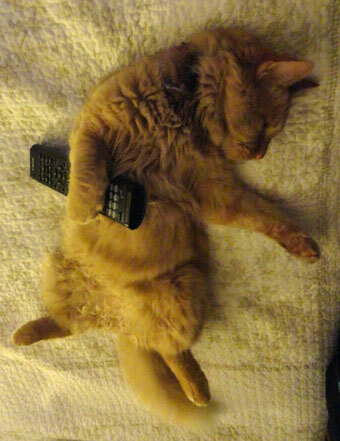 It’s hard to operate a remote when you’re asleep. This is a funny one, but Sparky the Wonderdog is calling for equal time! Sparky moves so fast it’s impossible to take a picture of her. First off, that is funny? Is this your cat. First off, that is funny? Is this your cat? Yes. That’s our crazy cat. We call him “Floof” – for obvious reasons. Yeah, that’s a cool cat!! !